Every year Albion welcomes new faculty to campus, and for fall 2017, Albion has welcomed 20 new members. 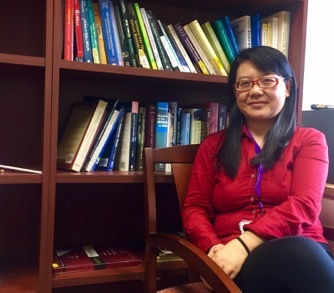 One of those 20 new members is visiting instructor of Communication Studies, Fang Wang, Ph.D.
Dr. Wang, originally from China, was most recently a teaching assistant at Bowling Green State University. She began her studies in communication when teaching the Chinese language in America, her office being in a communication department building. Her outreach to professors and graduate students in the department building lead her to auditing a few communication classes at BGSU, and she became interested in communications. Dr. Wang’s specific focus in communication is public health, especially on the issue of global obesity. Her dissertation focused on the communication role in the specific eating behaviors of college students and how to address that in campaigning against unhealthy behavior. She then found her passion in studying the ways to communicate the importance of health to the public realm, like how communication scholars have reduced smoking habits in the youth by campaigning. As she arrived at Albion, Dr. Wang noticed one thing that stood out to her among many other schools: the remarkable students. “I love the students. They are motivated the majority of the time, they know what they want. They are very collaborative and want to do collaborative work with the professors, that’s the most impressive thing,” said Dr. Wang. The students at Albion enjoy a well-rounded existence, Wang said, compared to those at other colleges or large universities she is familiar with, in that they can study, work, play sports, join clubs, do research — and still find time to sleep. “They’re so amazing, I think, ‘Oh my goodness, how can they work, and do other things at the same time,’” she said. Student diversity on campus is also essential for Dr. Wang. Ever since she got to Albion, she looked for fellow Chinese students to share a similar, comfortable background with. When she stumbled upon some of Albion’s international students, they instantly connected, and Dr. Wang was ecstatic to find diversity on Albion’s campus. “[…] since we have an international background, we all have something in common. It’s like a supportive work,” said Dr. Wang. As a visiting instructor at Albion, Dr. Wang hopes to communicate with fellow students, international or not, and looks forward to learning more about what Albion is about. She also is looking for a partner to play ping-pong with — bring your own paddle!